I believe that I shall look upon the goodness of the Lord in the land of the living! Wait for the lord; be strong, and let your heart take courage; wait for the Lord! At some point, we all ask God, “Where are you? ?” There are times when running our businesses we wonder how God is working in our business, if He even is at all. 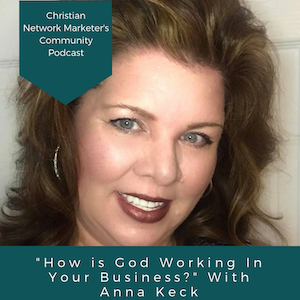 Today I have an interview with Anna Keck, and she talks about waiting on the Lord in our business and how hard that can be. Here are just some of the takeaways that I gained from talking to Anna about her business and how God is working in her. Please listen to the entire episode or watch the video in the link below. 3. Anna’s laminated sheet to keep herself focused was brilliant. Thanks for reading this post. If you want to see more about what the Christian Network Marketer’s Community is all about, please go to cnmcommunity.com/group and join our free Facebook group.